The EM9 is a complete embedded SBC for use on any carrier board in different industrial environments. The final application consists of a stand-alone EM9, an EM9 with an application-specific carrier card and/or with additional PCI-104 modules. The EM9 is controlled by an integrated PowerPC® MPC8548 or MPC8543 processor (optionally with encryption unit) running at clock frequencies between 800 MHz and 1.5 GHz. The EM9 is equipped with soldered DDR2 SDRAM for data and with NAND Flash for program storage. It provides front-panel access for three Gigabit Ethernet channels and one COM port via four RJ45 connectors. Additional functionality such as graphics, touch, CAN bus, protocol converters etc. can be realized in an FPGA for the needs of the individual application. The corresponding connectors are available on a carrier board. Application software dynamically loads the functions of the FPGA. The EM9 comes with MENMON™ support. This firmware/BIOS can be used for bootstrapping operating systems (from disk, Flash or network), for hardware testing, or for debugging applications without running any operating system. The EM9 is a communication engine ideal for use in embedded applications, for instance as an embedded Linux server, but also for high-end automation and robot control under a real-time operating system. For a first evaluation of the functions of the EM9 we strongly recommend to use the EK9 ESM™ starter kit. The kit consists of the standard CPU module, an FPGA loaded with additional I/O functions, the carrier card with I/O connectors, an external PSU, cables, and an adapter for mounting a PCI-104 module. ESM™ modules consist of the hardware (CPU, chip set, memory, I/O) which is not fixed to any application-specific function, and an FPGA programmed in VHDL code, which provides I/O that is also still independent of a specific application. 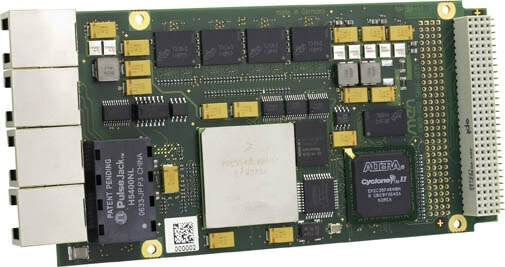 ESM™ modules are based on PCI. They have two or three system connectors: J1 has a fixed signal assignment, while J2 is variable depending on the final application-specific configuration of the ESM™ and the carrier board. J2 also feeds the I/O signals of the functions programmed in the FPGA to the carrier card. Some ESM™ modules have an additional J3 connector that is used to replace the front I/O connectors to route the signals to the carrier board or to the backplane of a CPCI or VME system. For a first evaluation of the functions of the EM9 we strongly recommend to use the EK9 ESM™ starter kit. The kit consists of the standard CPU module, an FPGA loaded with additional I/O functions, the carrier card with I/O connectors, an external PSU, cables, and an adapter for mounting a PCI-104 module. ESM™ modules consist of the hardware (CPU, chip set, memory, I/O) which is not fixed to any application-specific function, and an FPGA programmed in VHDL code, which provides I/O that is also still independent of a specific application. ESM™ modules are based on PCI. They have two or three system connectors: J1 has a fixed signal assignment, while J2 is variable depending on the final application-specific configuration of the ESM™ and the carrier board. J2 also feeds the I/O signals of the functions programmed in the FPGA to the carrier card. Some ESM™ modules have an additional J3 connector that is used to replace the front I/O connectors to route the signals to the carrier board or to the backplane of a CPCI or VME system.